Erie’s Award Winning Outdoor Living Experts! 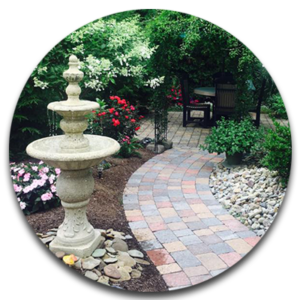 Founded in 1999, Kunco Landscape Inc. has strived to become Erie’s premier full service landscaping contractor, specializing in all your outdoor living needs. From landscape renovations to large outdoor living spaces, Kunco Landscape has a highly trained and certified staff tailored to meet your needs. 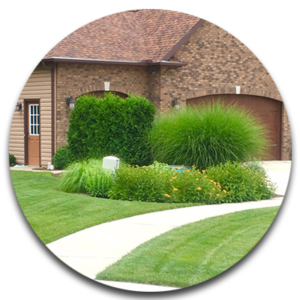 With our unwavering commitment to excellence and dedication to customer satisfaction, we lead the way in landscape design and installation practices. Kunco Landscape also provides snow plowing services in Erie, PA. Please call us for details ​814-899-1880. With over 40 years combined landscape design & management experience we produce the highest level of quality and workmanship available. 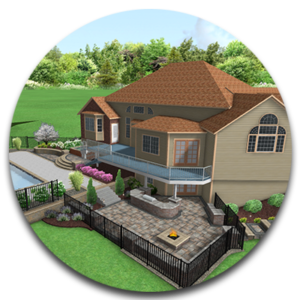 Our design team offers 3D design walk-throughs, photo rendering and scaled CAD blueprints so you can visualize your project prior to signing, thus eliminating any guess work of what the finished project might be! We just wanted to thank you for the beautiful patio and walkways. It looks spectacular and is more than we could have imagined. We appreciate all of the hard work in all kinds of weather. You truely are a premier company that puts the customer first! Thanks again! We love your work! Just a little note to let you know that John and his crew did a great job at my house last week. He was very accommodating and thinned out the perennials and placed them just right. I know there was a lot to do in the yard and they made it look beautiful. Thanks! Just a note to say thanks for a job well done! I like the no-nonsense attitude and good work ethic of your men. Your business presents itself well, from your attractive clean trucks to the attire of your workers - I like the red shirts. As long as I receive this good service, you will be the number one choice on my list! Just a little note to thank you again for the beautiful patio and landscaping job -- your workers were great and we think the job came out wonderfully! Hope you all have a wonderful winter holiday season and we look forward to working with you again in the future. The landscaping is more beautiful that I expected! You did a great job filling in and weeding the area by the driveway and sidewalk. Thanks for doing such an excellent job! We are very pleased with Kunco Landscaping's stonework. My biggest pleasure was their plan to cover my existing ugly concrete patio with pavers and integrate it seamlessly with the new paver patio area. 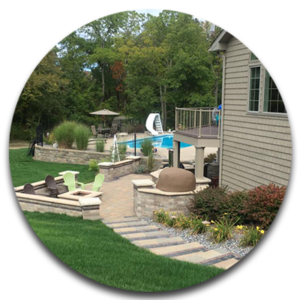 Our yard posed several challenges due to the elevation of the existing patio.Kunco Landscape worked diligently to keep everything level and totally wheelchair accessible. The Kunco Landscape team are prompt, polite and hard working. They replanted several plants that had to be moved during construction, reseeded where needed and removed all debris. We highly recommend Kunco landscape. Your staff is an amazing group, always friendly and courteous. Kudos to Kunco! Ron Just a note to let you know how pleased we are with the landscaping of our lot. Your vision and experience created a proposal that has taken our lot to another level. You definitely exceeded our expectations. Tell your crew they did a great job. Can't wait until spring so we can proceed with the remaining plantings. Over the winter, we can work together to revisit the planting choices and take advantage of some of the expanded planting areas that evolved. We would like to develop the sloped areas down to our property line. Ron Kunco and all of his crew at Kunco Landscaping were very professional. From concept to design to completion, I could not be happier. They created a patio, walls, and columns as part of our new portrait park at Lorei Portraits. I want to thank you and also acknowledge your crew. The work at 5013 Sunnydale was of the highest quality and professionalism of any of the trades used to rehabilitate a home and its property. You were prompt, you were competitive in price and the quality of your work is evident. Even the neighbors commented on how professional and even kind your workers were. Here's to the great work Johnny does laying paver blocks - it is truly evident as I spend countless hours shoveling my walk and driveway.., happily the surface is extremely level and I haven't had a sprained wrist from shoveling into a high block anywhere. That's a quality installation!! I want to convey how professional the crew was in their installation of the lawn and cleanup. They were meticulous in everything they did and were helpful in letting me know what to do with the lawn over the next few weeks. The lawn looks great! We looked at several different landscaping companies large and small before choosing Kunco Landscape. They really had the right balance with offering personal service, and delivering the knowledge of a well established company. After we agreed on a landscape plan, the staff incorporated ideas into the plan that exceeded our expectations with color & definition. The staff always listened to our requirements in a professional & innovative way. Kunco’s crew was professional, always on time, and implemented excellent workmanship. Our yard has been converted from a lackluster curb appeal to beautiful. Thank you very much for the great landscape. We are very, very pleased with all of your hard work and design help. Our home looks really beautiful now. We appreciate all you have done. We are receiving al lot of compliments and would gladly recommend Kunco Landscaping. Many Thanks! ©2018 Kunco Landscape. All Rights Reserved.